This little number was a thoughful gift from a regular logophile reader who fully appreciates my unnatural attraction to the "chuck". it's nice at such a religious time of year to see the chuck fully engaging in the spirit of things. This one is a picture i've had on file for a while and i like it. quite sweet. I can guarantee you that i would rather see this nasty nuns baps than chucks anyday. 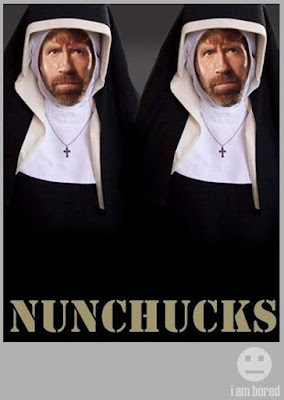 so if the image of chuck in a dress is a little too disturbing for you, nestle in the bosom of nun no.2 and restore order in your world. A hot nun - thank you God!